This morning was our penultimate digital hunt, and it should've been called the "Search for Mimì" rather than "Search for Cinderella," because our prize was a pair of tickets to next month's production of La bohème, along with dinner for two at Ten Mercer and a night's stay at The Maxwell Hotel. As we've done with the two other hunts, we'll break this one down and show you how the winner got to the end of today's trail of clues. Congratulations to Dale Abersold for winning our grand prize and to Greg Barnes for claiming the runner-up prize of two tickets to the Young Artists Program's "Viva Verdi!" concert on April 6! The final blurb of text on the page read "Tweet Tweet" and provided a timestamp, which was a clue toward our Twitter feed. Sure enough, there was an update we'd tweeted yesterday (15 JAN 13) at 2:27 PM. That link was to bass Arthur Woodley's Q&A on this here blog. 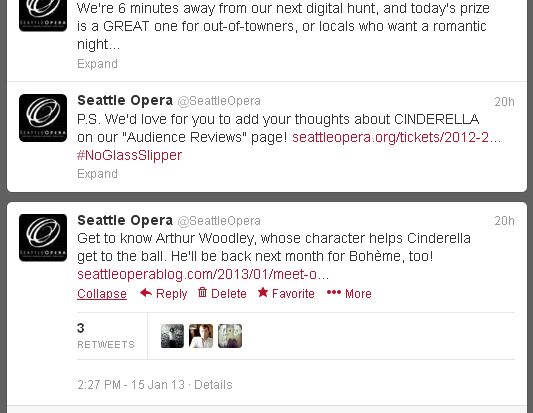 This particular page was chosen, by the way, because Woodley stays in Seattle following Cinderella and will also perform in La bohème! Once on his blog, you may have noticed a suspiciously large gap in the text. If you had highlighted that area, you would have been able to read the hidden message. 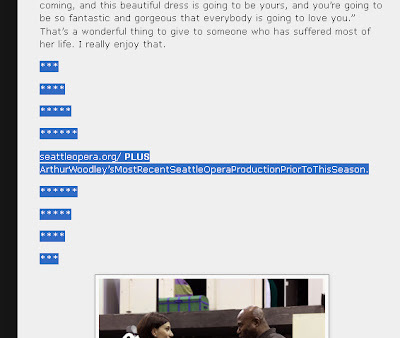 That message read "seattleopera.org/ PLUS ArthurWoodley’sMostRecentSeattleOperaProductionPriorToThisSeason." That was supposed to guide you to a URL, and some research would've told you that prior to 2012/13, Arthur Woodley sang in 2010's Lucia di Lammermoor. So, going to seattleopera.org/luciadilammermoor redirected you to Stage Director Tomer Zvulun's bio on our website. 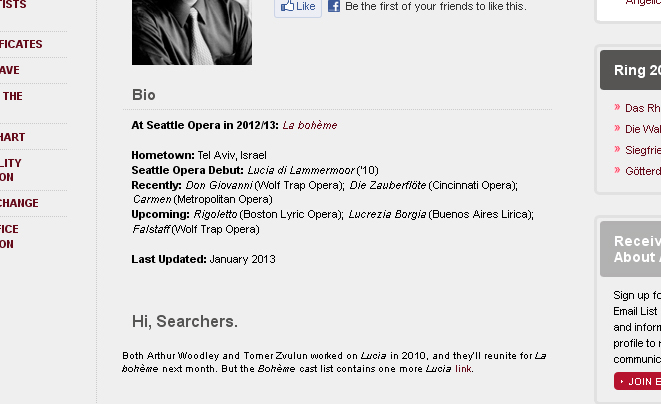 As the clue read, Zvulun worked with Woodley in Lucia di Lammermoor, and both will return for La bohème. 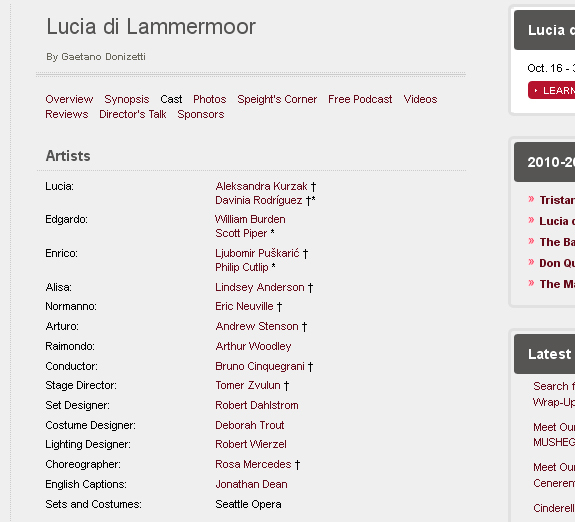 But that production of Lucia has one other link to Bohème, and the word "link" was, appropriately enough, hyperlinked to take you to the cast page for Lucia. 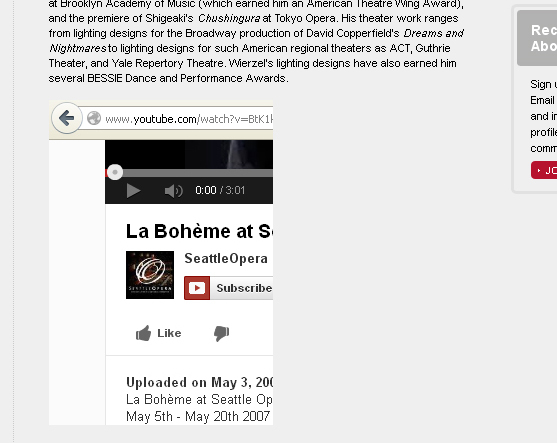 Had you compared that list of artists to the one for Bohème, you would have noted that there's only one commonality, besides Zvulun and Woodley. And that's Lighting Designer Robert Wierzel. Clicking on Wierzel's name takes you to his bio, which had a bonus image embedded. That was a screen cap of our 2007 Bohème trailer on YouTube. Everything would have seemed normal on this page--unless you had clicked "Show more." Then you would have been presented with a series of dots and dashes. 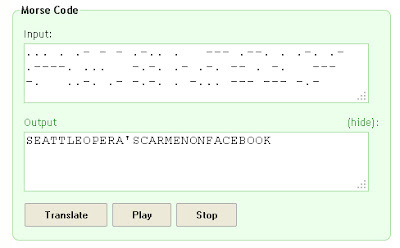 That's Morse Code, and you didn't need to be fluent to translate it; a visit to any search engine would yield tons of Morse Code-to-English translators. 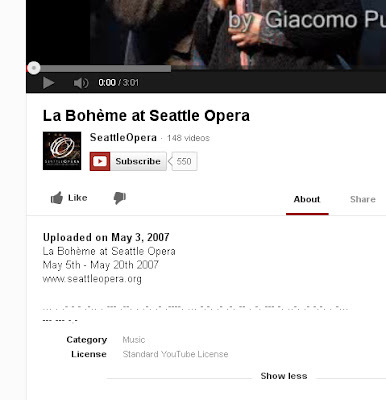 That particular photo shows Elizabeth Caballero, who was Susanna in 2009, and returns as Mimì in Bohème. 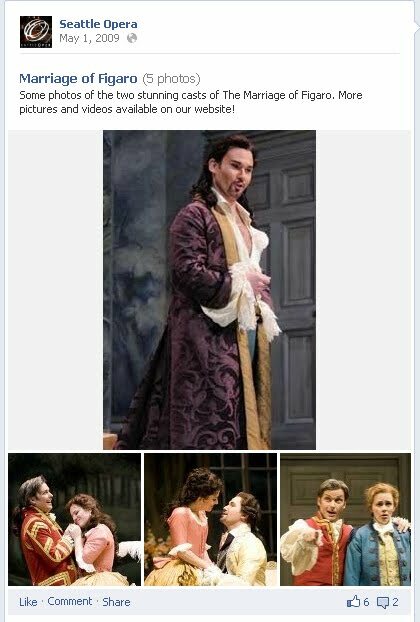 And the caption pointed our victors toward today's special e-mail address, AllAboutMimi2013@gmail.com, which they e-mailed to claim their prizes! That wraps up today's hunt, but there's still one more to go. Make sure to come back this Friday for one final grand prize, as well as a runner-up prize of "Viva Verdi!" tickets.